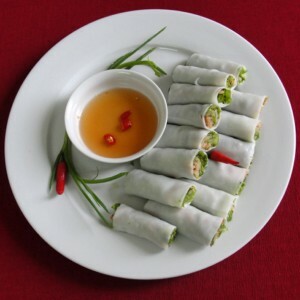 If you are looking for some excellent restaurants you will not be disappointed and for Vegetarians there are many vegan restaurants in Hanoi both diversified both in range and size. From small family restaurants to local restaurants and even homely restaurants, vegan restaurants are getting more and more popular. Here are some favorites for you to try. Located at 79A Tran Hung Dao Str. behind an old villa, Nang Tam restaurant is the oldest vegan restaurant in Hanoi, established back in 1995. The atmosphere here is created by yellow and green colors, main design of the house. Waiters and waitresses are also elegant in matching yellow/brown uniforms. Nang Tam has an eclectic menu, and one of the most delicious foods here, which you should not miss, is “Fried young tofu” with tofu covered by flour and deep fried. The skin is crispy and tofu is smooth/soft, bringing an unforgettable experience for guests. Moreover, the prices here are reasonable, just from 30,000 VND for a meal. Bo De Tam is a Buddhism-influent restaurant, since the name Bo De Tam means “The heart of Buddha”. Bo De Tam has two restaurants: One at 68 Pham Huy Thong Str. and their second at 89 Nguyen Khuyen Str. With bamboo chairs and table, Bo De Tam recalls the spirit of ancient Vietnamese houses. Bo De Tam is famous for their swallow soup, which brings customers the energy needed for refresh, and their Arhat (La Han) high class vegan meal, which contains the foods are believed that were eaten by Arhat thousands years ago. 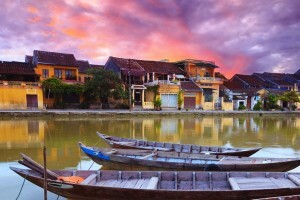 Although the price here is a little bit higher than Nang Tam, it still attracts customers because of their unique dishes. Ha Thanh Restaurant (116/166 Kim Ma Str) is a newer member in vegan market in Hanoi opened in 2010, but with its wide range of foods and some special offers, Ha Thanh has become on one of the hot spots. 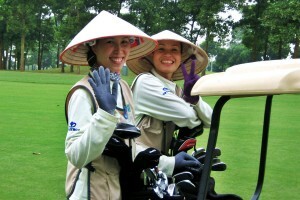 Ha Thanh can serve many kinds of demands, from students, ordinary officers, workers’ meals to party, meeting banquettes or anniversaries. 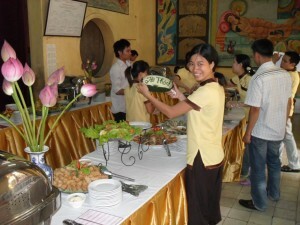 Ha Thanh supplies meals (for 6 people) with price from 300,000 VND to 600,000 VND/meals. 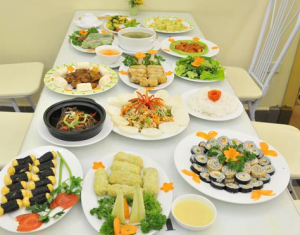 Moreover, Ha Thanh has hot pot options, with Thailand hot pot, mushroom hot pot and mix hot pot, with reasonable price from 200,000 VND to 400,000 VND. These hot pots can be a witty choice in winter to against the cold outside. 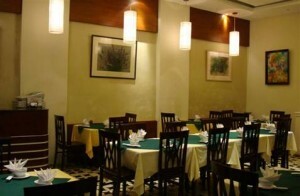 estaurant in Hanoi, located at 4/192 QuanThanh Str. 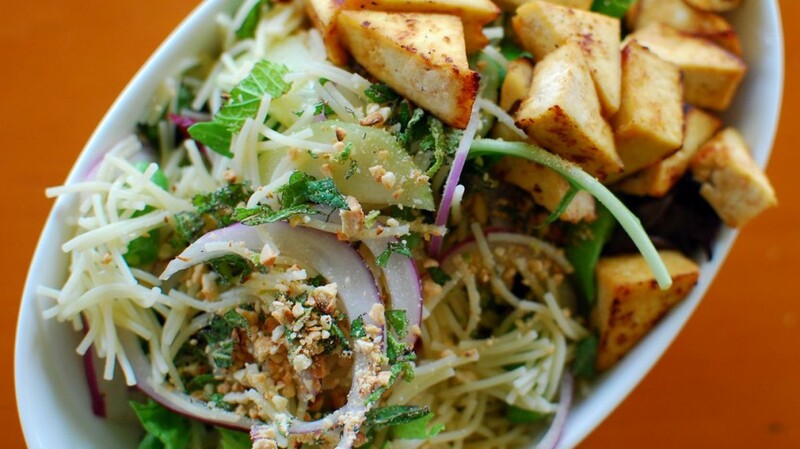 The Gioi Chay provides the freshest vegan dishes in Hanoi, and the prices are very reasonable. 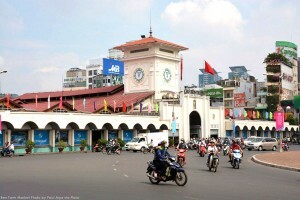 You can have a good meal here with just 20,000 VND – 30,000 VND. The Gioi Chay also offers hot pots and banquette, but is unable to beat Ha Thanh in term of variety. On the other hand, The gioi chay is unique with the famous vegan gateaux cake, with very appetizing taste but no involvement of egg or milk, totally vegan.